Just under 200 million pounds of pesticides a year are used on California’s crops. When it comes to using them safely, 56 county agricultural officers are local communities final line of defense. But a new report produced at UCLA suggests that a lack of guidance for county agricultural offices in considering alternatives or cumulative impacts for toxic exposures, may be putting people at risk. California first established a regulatory scheme for pesticides in 1901, making the state a uniquely independent watchdog. 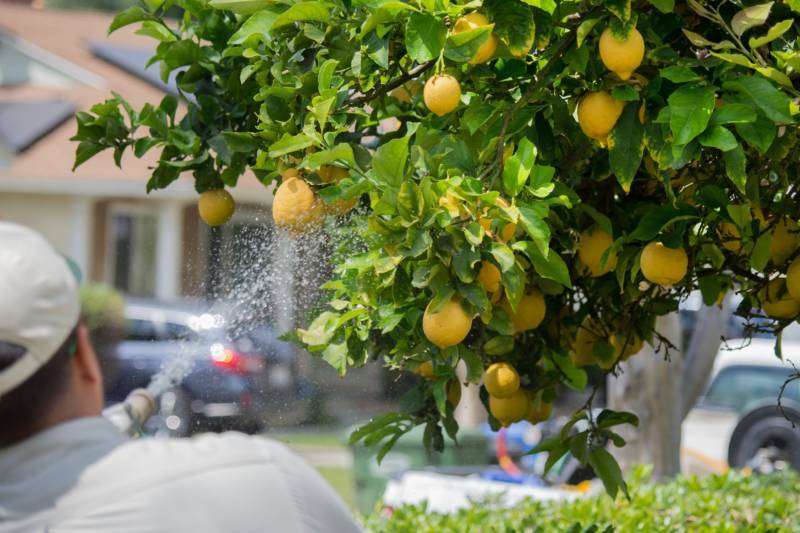 When the state’s oversight of pesticides diverges from that of the federal government, as with chlorpyrifos — a neurotoxin used on pests to citrus and almond crops — it draws national attention. UCLA’s analysis used permitting for chlorpyrifos as a test case to analyze how ag officers consider alternatives. What’s chlorpyrifos, and what do we know about its risks? Chlorpyrifos is a neurotoxin, first produced by the Dow Chemical Company in 1965, that’s meant to disrupt the nervous system of insects by inhibiting production of an enzyme. Mounting evidence concludes that whether touched, tasted, or eaten, it’s dangerous to humans as well. Most often, people consume tiny, tiny amounts of it as residue on vegetables and fruit. Agricultural workers are most at risk of coming into contact with it, and so are their children: the pesticide makes its way into homes and house dust via clothing and shoes. Chlorpyrifos is blamed for harming babies’ brains. One 2016 Environmental Protection Agency concluded that no known safe level of human exposure exists. Who’s in charge of deciding where and how pesticides can be used on California cropland? Manufacturers must register pesticides at the state level, with the Department of Pesticide Regulation. People who want to use pesticides on their land apply for annual permits from county agricultural officers, and then seek approval on a case-by-case basis throughout the year. Some pesticides are best applied when trees aren’t leafed out, for example. Critics, including UCLA’s Malloy, argue that DPR should consider alternatives when registering new products. But in the past, state officials have argued that considering alternatives isn’t necessary where it’s possible to mitigate harmful effects — like if pesticide application can keep a greater distance between crops and people, or if certain equipment is used that minimizes the distance pesticides can travel on wind beyond the intended targets. And the state has said that county officials can look at specific conditions— like weather, landscape, time of year, risks to surrounding areas — most effectively. How does pesticide approval actually work at the local level, when it comes to considering alternatives that may be less dangerous? The state’s guidance generally says that considering safer alternatives comes after seeing whether there are safer ways to use the pesticide under consideration. According to county officials and the UCLA analysis, local officials each interpret that guidance a little differently. For example, two pests to almond orchards have just one well-known pesticide enemy that can eradicate them: chlorpyrifos. So, while its use carries risks, a farmer may still want to use it. Some agricultural officials say they ask for proof that the stubborn pests are present before they permit chlorpyrifos application. Some don’t. Records reviewed by the UCLA team don’t describe either method of judgment in detail. Some county officials say that they’re averse to recommending alternatives. Juan Hidalgo, agricultural commissioner for Santa Cruz County, says it’s not his job to recommend specific alternatives by brand name. 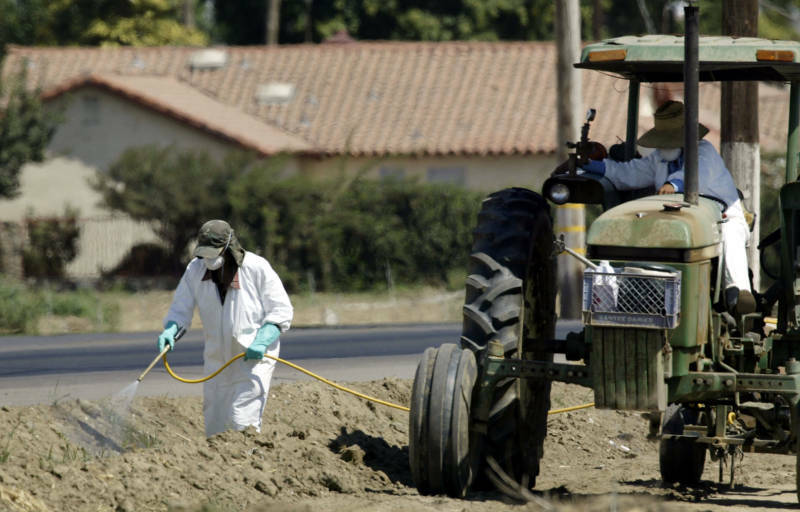 The case was one of several pesticide incidents that sickened 150 agricultural employees in the Central Coast and Central Valley last year. 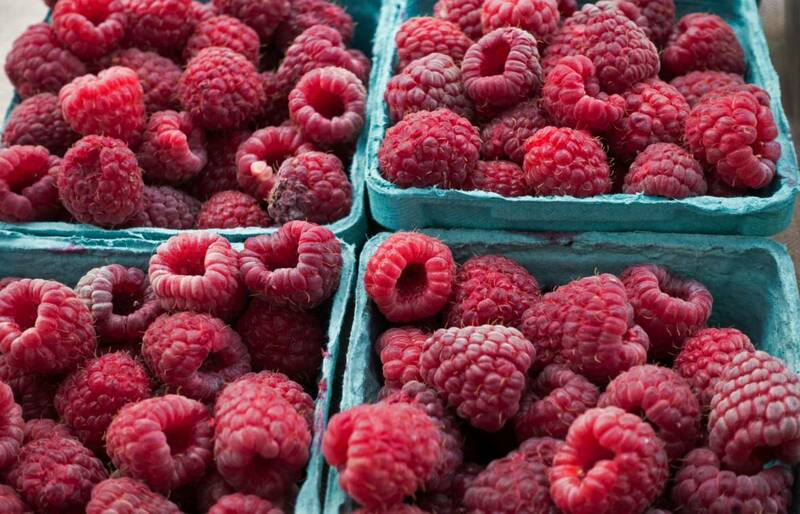 Pesticide reform advocates have lobbied local officials to consider more safer alternatives. Sarait Martinez, who seeks to limit toxic pesticide use in Santa Cruz and Monterey Counties, says she and a group of more than three dozen activists had an unsuccessful encounter with a deputy ag commissioner in Monterey. Critics to the current system argue that, because every alternative is going to have certain tradeoffs associated with its use, systematic recordkeeping about how alternatives are judged would help better establish the value of the alternatives themselves. How do state and local officials justify their permitting of pesticides like chlorpyrifos? But Malloy stresses that chlorpyrifos is just one pesticide, and that others need consideration of alternatives too. “The issue with alternatives is, if you’re not actively looking for them, then you don’t have a set of incentives that are going to lead to the diffusion of safer alternatives over time,” he says. DPR continue[s] to engage with the County Ag Commissioners in developing guidance on the availability of other active ingredients for an alternative analysts, and keeps them informed on any update in the scientific justifications for mitigation of specific active ingredients. The scientific literature and guidance for assessing cumulative effects is still relatively new and has not been fully vetted, however DPR ensures that our scientists are kept abreast of the most current science on that issue. As new and innovative scientific protocols become available DPR will assess the feasibly of those recommendations in the regulatory program. California’s trade association for agricultural officers, CACASA, places the responsibility for determining pesticide safety firmly in the hands of state and federal governments. “County agricultural commissioners follow the guidance and mitigations directed by EPA and DPR and may also require additional mitigations based on site specific conditions,” says Sandy Elles of the California Agricultural Commissioners and Sealers Association, in an email. Ultimately, legislators may determine the fate of chlorpyrifos. Maria Elena Durazo, a state senator from East Los Angeles, has introduced legislation to ban chlorpyrifos in California. The first hearing on the bill is scheduled for April 10.